Acute aortic pathologies require prompt and accurate diagnosis for successful treatment. In addition to traumatic aortic transection, which we do not address in this article, acute aortic pathologies primarily include acute aortic syndrome (AAS) and symptomatic aneurysms. AAS refers to acute aortic dissection (AAD), intramural hematoma (IMH), and penetrating aortic ulcer (PAU). AAD is, by far, the most common presentation within the AAS spectrum and occurs with an intimal tear leading to separation within the medial layer of the aortic wall and development of a true lumen (TL) and false lumen (FL) (Figure 1).1 IMH is hematoma within the medial layer of the aorta without the presence of an identifiable intimal tear. Although one hypothesis states that IMH arises from hemorrhage of the vasa vasorum within the medial layer of the aortic wall,2 more recent evidence with improvements in imaging indicates that a significant number of patients with IMH present with focal intimal disruption,3 and some may actually be an aortic dissection in evolution (Figure 2). PAU is an ulceration within atherosclerotic plaque that penetrates into the aortic intima, leading to a hematoma within the aortic wall. Figure 1. A three-dimensional (3D) reconstruction of an acute type B dissection with a partially thrombosed FL (A). Cranial view of the same dissection with the yellow circle highlighting the proximal entry tear distal to the left subclavian artery (LSA) (B). Figure 2. A type B IMH beginning at the subclavian in a patient with persistent pain and increased diameter on repeat imaging (A). One-month postoperative CT after TEVAR in the same patient, with resolution of the IMH (B). Making an accurate diagnosis is particularly difficult because each of these processes shares similar features, can manifest concurrently, and may represent different stages of the same disease process. 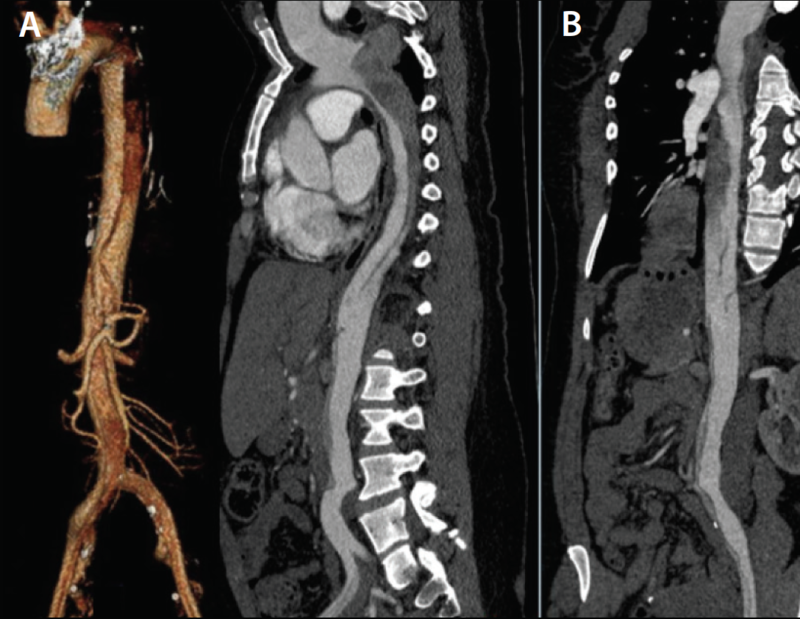 In this article, we describe the initial presentation, diagnostic evaluation, treatment, and long-term management of patients presenting with AAS and symptomatic aortic aneurysms. The presenting symptoms of AAS include severe pain in the chest, abdomen, or back, depending on the location of aortic involvement. Patients may be hemodynamically unstable if rupture has occurred, but are more often hypertensive on presentation. The initial challenge in making the correct diagnosis is the similarity of symptoms with other more common entities, such as myocardial infarction, pulmonary embolus, endocarditis, pancreatitis, or other more benign causes of abdominal or back pain. Appropriate consideration should be given to these other life-threatening conditions, but it is essential to perform appropriate imaging studies to evaluate for the presence of aortic disease. In particular, thin-cut (≤ 2 mm) CTA with arterial and venous phase imaging is valuable not only for making the diagnoses but also for assessing the often subtle differences between AAD and IMH with or without a focal intimal disruption (see the Pearls and Pitfalls of Early Diagnostic Evaluation for Acute Aortic Pathologies sidebar).4 Important factors to focus on from initial imaging include the location of the primary entry tear and extent of involvement for AAD, the location of the IMH (ascending vs descending aorta), overall size of the aorta, total aortic diameter for AAD, flow within the FL, and the presence of malperfusion to the extremities or viscera (Figure 3). Type A dissection is typically considered a surgical emergency, but the management of type B dissection/IMH has further nuance depending on acuity and complicating features. Herein, we primarily focus on acute aortic pathology distal to the arch. Figure 3. A 3D reconstruction of an initially uncomplicated type B dissection that was eventually treated due to persistent hypertension and pain (A). Centerline reconstruction showing the complex nature of the dissection (B). Of note, dissection is a dynamic process, and CTA is merely a snapshot of the overall process; it can be misleading in the actual anatomy/hemodynamics of the dissection. Aneurysm size, periaortic fat stranding, disruption in the calcific intimal rim, and fissures within the thrombus can all indicate impending rupture for patients with potential symptomatic aneurysms.5 Initial treatment for nonruptured and nonmalperfusing pathologies is focused on strict cardiac impulse control to reduce aortic wall stress and stop propagation of the aortic injury. Use of a Β-blockade is typically the initial approach used to manage hypertension and tachycardia. This is followed with calcium channel blockers and potentially sodium nitroprusside, but only after initiation of a Β-blocker to avoid reflex tachycardia. An often underappreciated aspect of the initial treatment is the use of antianxiolytics and pain control, which can be essential in limiting the progression of disease by decreasing the adrenergic response to pain. It is important to remember that aortic dissection is a dynamic disease, and although there may not be complicating features at initial presentation, progression of the dissection can certainly lead to malperfusion or even rupture later in the course.6 Early reimaging and intervention may be required based on symptoms or concerning features on initial imaging, and most patients in our practice will at least undergo a repeat CTA prior to discharge to evaluate for rapid aortic dilation, even if they do not undergo intervention (see the Pearls and Pitfalls of Initial Management sidebar). Symptomatic aneurysms are similarly treated with blood pressure control and pain medication/anxiolytics prior to surgical intervention. If an infectious etiology of the aneurysm is suspected, it is vital to obtain blood cultures before initiating antibiotics. The decision to proceed with surgical intervention for each pathology is dictated by the risk of life-threatening complications. Patients with truly uncomplicated dissection are relatively low risk and typically can be managed medically. However, those with type A dissections, complicated type B dissections, PAU with ongoing pain/associated IMH, IMH with focal intimal disruption and/or progression to a dissection, or symptomatic aneurysms all usually warrant intervention. Strictly speaking, AADs are considered complicated when there is associated aortic rupture or end-organ malperfusion, but other features can put uncomplicated patients into a high-risk category for early (eg, progression to malperfusion/rupture) or late (eg, aneurysmal degeneration) complications. These features are later outlined in more detail, but they include rapid expansion, refractory pain/hypertension, or radiographic malperfusion of end organs/extremities. Malperfusion can occur secondary to either a dynamic or static obstruction, which is often difficult to discern on static imaging. Dynamic obstruction occurs due to compression of the TL by pressurization of the FL or by a dissection flap prolapsing into the ostial vessel. Static obstruction occurs due to thrombosis of the propagating end of the FL, if it ends in a branch vessel, or fixed involuted intima in the dissected vessel lumen. In cases where there is question about whether a dynamic obstruction is present, dynamic imaging such as MRA can be very helpful. Of note, patients with type A dissection may have persistent malperfusion after repair or may develop malperfusion due to hemodynamic changes associated with the dissection septum after central aortic repair. For patients with residual dissection distal to the arch, the key deciding factor for early intervention revolves around the presence of malperfusion or rupture. Persistent abdominal pain, oliguria, or lower extremity pain should raise concern for malperfusion related to TL collapse or due to dynamic obstruction from the intimal flap. If abdominal pain persists after repair of a type A dissection, a high degree of suspicion for visceral malperfusion should be maintained and intervention may be warranted. As previously mentioned, AAD is a dynamic disease process and patients can develop malperfusion at any time during the acute phase of the dissection, warranting early reimaging.6 Duplex ultrasonography can be useful to evaluate visceral/renal flow in the setting of acute kidney injury or other contraindications to contrast, but it is of limited value in determining other important features that might warrant intervention. In some cases, intravascular ultrasound (IVUS) may be indicated for better evaluation of septal behavior, and performing direct pullback pressure measurements within branch vessels is an excellent method of evaluating for perturbation of flow to the end organs. Although medical management of uncomplicated type B dissections is generally considered first-line therapy, some believe that early thoracic endovascular aortic repair (TEVAR) is warranted in certain patients based on anatomic features that might make them higher risk for future aneurysmal degeneration. A recent publication by Schwartz et al demonstrated risk factors for late aneurysmal degeneration to include a large primary entry tear > 10 mm, total aortic diameter > 40 mm, fully patent or partially thrombosed FL, and a FL diameter > 22 mm.7 Although there are limited data, TEVAR in the very early phase of AAD is thought to carry an increased risk of both retrograde type A dissection and stroke. Thus, some investigators have recommended waiting at least 14 days after diagnosing type B dissection to perform TEVAR, when possible. As with uncomplicated type B dissections, uncomplicated IMH can have high-risk factors that may warrant early intervention. These factors primarily include focal intimal disruption, IMH secondary to a PAU, or progression to aortic dissection. Data from the IRAD (International Registry of Aortic Dissection) series noted a correlation between aneurysmal progression of an IMH and both initial aortic diameter and hematoma thickness. Aortic diameter > 40 mm was 30 times more likely to develop aneurysmal degeneration, whereas a hematoma thickness of ≥ 1 cm was nine times more likely to progress.8 PAU treatment is indicated for persistent pain, maximum aortic diameter of > 5.5 cm, rapid aortic growth during the initial hospital stay, or growth of > 0.5 cm per year. Repair is also indicated for certain high-risk features noted on the initial presentation, including the presence of an associated IMH, development of a pleural effusion (especially if high Hounsfield units indicate a bloody effusion), maximum diameter of the PAU > 20 mm, or a depth of > 10 mm.9 In a retrospective study of patients with IMH caused by PAU versus those with IMH alone, Ganaha et al demonstrated that patients with both IMH and PAU had a 48% rate of progression versus only 8% for those with IMH alone.10 Thus, patients with PAU associated with IMH are a high-risk group of patients who often warrant early intervention. TEVAR has become the preferred approach for type B dissection given the high morbidity and mortality associated with open repair (see the Pearls and Pitfalls of Early TEVAR for AAD sidebar).11 The goal of TEVAR in a complicated acute type B dissection is to cover the proximal entry tear, preferentially directing flow to the TL and depressurizing the FL. This differs in a dissection with rupture, for which coverage must stop all flow within the FL at the site of rupture, typically requiring more extensive aortic coverage and/or adjunctive maneuvers to facilitate FL thrombosis, which will not be detailed in this article. IVUS is an essential tool during TEVAR to ensure the wire only traverses the TL in the deployment zone. IVUS is also an excellent method to measure for device selection and to evaluate for adequate FL depressurization after graft deployment. The basic tenets of TEVAR for dissection and IMH include 0% to 9% device oversizing and avoidance of balloon molding of the proximal stent to lower the risk for a retrograde type A dissection. Coverage of the LSA can be performed in the emergent setting with delayed revascularization, if needed, unless the patient has a patent internal mammary artery (IMA)–coronary graft, which would necessitate immediate subclavian revascularization. Our preference is to always revascularize the LSA in nonemergent cases to decrease the risk of stroke and spinal cord ischemia (SCI). After treatment of the proximal entry tear with TEVAR, persistent dynamic obstruction from distal entry tears or static obstruction within the branches may persist. Successful depressurization of the FL can be nicely demonstrated with aortic IVUS; however, to evaluate for persistent static obstruction, it is essential to obtain an angiogram with dye injected within the endograft, rather than in the visceral segment where the dye may be artificially forced on power injection into the branch vessels and give a false representation of native flow. Persistent dynamic obstruction from aortic entry tears may warrant additional length of aortic coverage with TEVAR, and static obstruction may require individual branch stenting to restore perfusion. Rarely, open surgical treatment such as bypass, open septal fenestration, or infrarenal aortic replacement may be warranted to restore branch perfusion. Of note, any bypass must originate from an arterial source not involved with dissection, typically an iliac artery. Extra-anatomic bypass with either femoral-femoral bypass or axillobifemoral bypass can be used for lower extremity malperfusion if endovascular options are not possible or the best option. One of the most feared complications of TEVAR for acute type B dissection is the creation of a retrograde type A dissection, which then becomes a surgical emergency. In those with more extensive aortic coverage, with or without subclavian coverage, the risk of SCI is increased and appropriate measures to prevent this should be pursued. These include maintaining increased mean arterial pressures, spinal drainage, and other adjuncts beyond the scope of this discussion.12 One newer technique to limit the amount of aortic coverage while still promoting restoration of TL diameter is the use of a bare-metal stent extending into the visceral aorta, also known as the petticoat technique.13 The long-term benefits of this treatment are promising, but whether it provides any benefit over standard TEVAR is not yet known. TEVAR is the treatment of choice for IMH and PAU.2,14 Although treatment of an isolated PAU without IMH, when indicated, is rather straightforward, treatment of IMH is quite nuanced, similar to the treatment of an AAD. Ideally, treatment for both IMH and PAU would include coverage of the entire diseased segment, sealing within the healthy aorta to avoid the risk of tearing into the FL with the stent graft. IVUS is again a vital tool to identify small entry tears in this scenario. If the entire aorta through the visceral segment is involved, our practice is to extend the repair to the level of the diaphragm. Further treatment of the visceral segment is then based on symptoms or progression of disease/aneurysmal degeneration, similar to that mentioned for AAD treatment. SCI is clearly a concern with extensive aortic coverage, and early reimaging is important. The risk of a stent graft–induced new entry (SINE) tear could convert an IMH into an acute dissection, but the incidence of this is largely unknown. Aggressive oversizing in IMH is ill-advised, and the risk of SINE should be taken into account during operative planning. Symptomatic aneurysms generally require urgent repair to avoid rupture (see the Pearls and Pitfalls of Symptomatic and Infected Aortic Aneurysms sidebar). Standard anatomic constraints apply for endovascular approaches. As previously mentioned, if infection is suspected, it is important to draw blood cultures prior to beginning antibiotic therapy. Operative cultures should be taken as well. The presence of infection substantially changes the operative plan and requires the use of alternative conduits (Figure 4). Figure 4. Three-dimensional and centerline reconstructions of a ruptured perivisceral infected aneurysm (A, B). Intraoperative photo of the repair with a rifampin-soaked Dacron graft with left renal bypass and reimplantation of a right accessory renal artery (C). Patients should continue to undergo strict blood pressure management in the postoperative setting, but the desire to have a normal blood pressure must be weighed against the risk of SCI after lengthy aortic coverage. Patients should undergo frequent (hourly) neurologic checks to ensure that they are able to lift their legs off the bed. Any weakness should be considered SCI until proven otherwise. In complicated cases, early reimaging is warranted after TEVAR to ensure successful cessation of flow in the FL for patients with ruptured dissection and to ensure restoration of flow to branch vessels for those with malperfusion. Given that CTA does not truly demonstrate flow due to the static nature of the study, ultrasound can be very helpful in determining flow in equivocal cases or those with a contraindication to contrast. MRA can also be helpful but may not be possible depending on the area of the aorta to be examined due to imaging voids secondary to the metallic graft components. Our practice is to perform very early reimaging on ruptured patients, especially prior to any decompression of their hemothorax, and to perform CTA at least once prior to discharge on all other patients. AADs are also at increased risk for progressive aneurysmal degeneration of the perivisceral segment developing a thoracoabdominal aneurysm in nearly 30% of patients.17 This again highlights the importance of life-long surveillance and proper medical management. Aneurysmal degeneration to 5.5 to 6 cm, evidence of malperfusion, and aortic rupture are all indications for reintervention (see the Pearls and Pitfalls of Postoperative Follow-Up and Management sidebar). The diagnosis and management of acute aortic pathologies is challenging and often requires quick and decisive action. Having a stepwise approach to patient evaluation and access to endovascular technologies are essential to successful short- and long-term management of these patients. Understanding the dynamic nature of aortic dissection and IMH is important in selecting the appropriate course of action and in maintaining close long-term follow-up. 1. Olsson C, Thelin S, Ståhle E, et al. Thoracic aortic aneurysm and dissection: increasing prevalence and improved outcomes reported in a nationwide population-based study of more than 14,000 cases from 1987 to 2002. Circulation. 2006;114:2611-2618. 2. Eggebrecht H, Plicht B, Kahlert P, Erbel R. Intramural hematoma and penetrating ulcers: indications to endovascular treatment. Eur J Vasc Endovasc Surg. 2009;38:659-665. 3. Moral S, Cuéllar H, Avegliano G, et al. Clinical implications of focal intimal disruption in patients with type B intramural hematoma. J Am Coll Cardiol. 2017;69:28-39. 4. Sebastià C, Pallisa E, Quiroga S, et al. 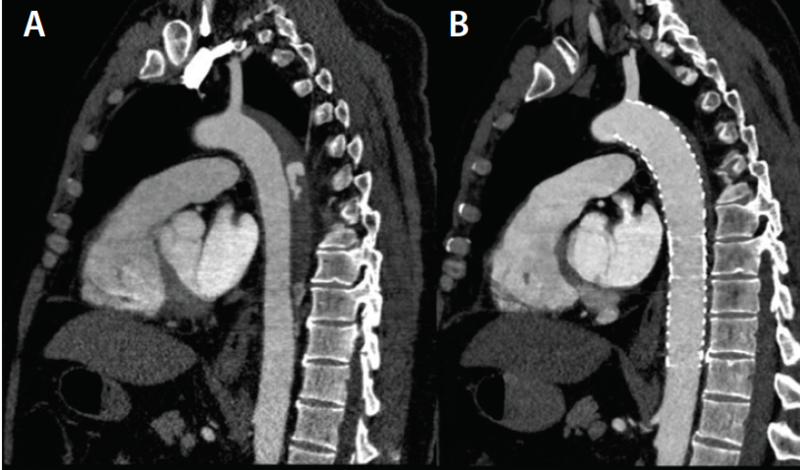 Aortic dissection: diagnosis and follow-up with helical CT. Radiographics. 1999;19:45-60. 5. Rakita D, Newatia A, Hines JJ, et al. Spectrum of CT findings in rupture and impending rupture of abdominal aortic aneurysms. Radiographics. 2007;27:497-507. 6. Reutersberg B, Trenner M, Haller B, et al. The incidence of delayed complications in acute type B aortic dissections is underestimated. J Vasc Surg. 2018;68:356-363. 7. Schwartz SI, Durham C, Clouse WD, et al. Predictors of late aortic intervention in patients with medically treated type B aortic dissection. J Vasc Surg. 2018;67:78-84. 8. Sueyoshi E, Imada T, Sakamoto I, et al. Analysis of predictive factors for progression of type B aortic intramural hematoma with computed tomography. J Vasc Surg. 2002;35:1179-1183. 9. Evangelista A, Czerny M, Nienaber C, et al. Interdisciplinary expert consensus on management of type B intramural haematoma and penetrating aortic ulcer. Eur J Cardiothorac Surg. 2015;47:209-217. 10. Ganaha F, Miller DC, Sugimoto K, et al. Prognosis of aortic intramural hematoma with and without penetrating atherosclerotic ulcer: a clinical and radiological analysis. Circulation. 2002;106:342-348. 11. Fattori R, Cao P, De Rango P, et al. Interdisciplinary expert consensus document on management of type B aortic dissection. J Am Coll Cardiol. 2013;61:1661-1678. 12. Scali ST, Kim M, Kubilis P, et al. Implementation of a bundled protocol significantly reduces risk of spinal cord ischemia after branched or fenestrated endovascular aortic repair. J Vasc Surg. 2018;67:409-423. 13. Lombardi JV, Cambria RP, Nienaber CA, et al. Aortic remodeling after endovascular treatment of complicated type B aortic dissection with the use of a composite device design. J Vasc Surg. 2014;59:1544-1554. 14. Geisbüsch P, Kotelis D, Weber TF, et al. Early and midterm results after endovascular stent graft repair of penetrating aortic ulcers. J Vasc Surg. 2008;48:1361-1368. 15. Yang CP, Hsu CP, Chet WY, et al. 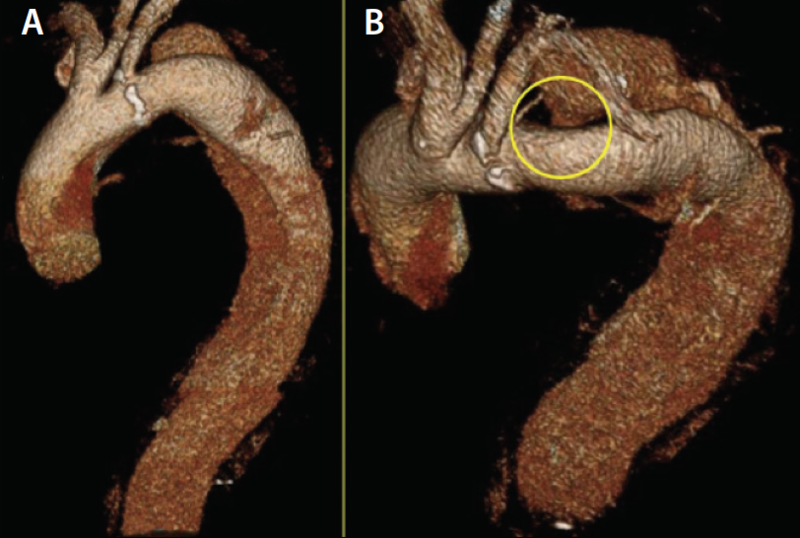 Aortic remodeling after endovascular repair with stainless steel-based stent graft in acute and chronic type b aortic dissection. J Vasc Surg. 2012;55:1600-1610. 16. Dong Z, Fu W, Wang Y, et al. Stent graft-induced new entry after endovascular repair for Stanford type B aortic dissection. J Vasc Surg. 2010;52:1450-1457. 17. Durham CA, Aranson NJ, Ergul EA, et al. Aneurysmal degeneration of the thoracoabdominal aorta after medical management of type B aortic dissections. J Vasc Surg. 2015;62:900-906.